Is Twitter a media company? There’s no doubt about it. Today the social network introduced trends for 100 more cities, which you will now find on your dashboard. As always, to change the demographic of the trends there’s a “Change” link next to the Trends title. 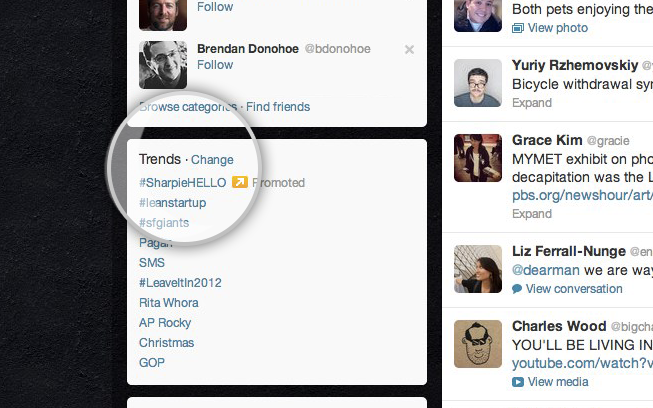 When you click on that, you’ll be notified to change the trends that by default have been tailored to you. You’ll then see a list of countries, and by selecting one, a list of supported cities follows. The update adds a new angle to the way we browse Twitter. By nature, these trending locations are filters for the events that are taking place around the world. When users search for a disaster for example, they’ll search by the location of the incident or the name (should it have one). This makes finding the most relevant hashtags that much easier. For instance, trends in New York City would have undoubtedly mentioned Hurricane Sandy due to the location. In less harrowing circumstances, if you searched for London, United Kingdom this past summer, the London Olympics surfaced to the top of the trends. These locations would have listed the hashtags of important events that were taking place at those places. In doing so, users wouldn’t have to worry about trying to find out the exact hashtags that people are using because Trends lays it out there for you. Trends is a powerful feature outside of just for social media marketing purposes. “This is why Twitter uniquely captures the pulse of the planet, and the pulse of your city: By surfacing the topics that people care about. We’ll continue to add Trends locations so that it’s easy for more people to quickly see what others are talking about, globally and locally,” Twitter Search and Relevance Engineer Kostas Tsioutsiouliklis wrote in the blog post. It’s a rather rudimentary curation feature, and as a matter of fact poses a threat to third-party developers like Storify who specialize in curation. Storify announced a redesign late last month to help its users find out what’s going on in the world in real-time using stories shared through social networks. When we last spoke to Storify, co-founder Burt Herman wasn’t concerned about his company since Twitter didn’t offer curation tools. But starting today it’s looking more like Storify and similar startups may want to start worrying.